So after I decided now was the time to start weening, Ellie refused to drink anything from a bottle for the next three days. What the what!? Arg. Then I watched a documentary on breastfeeding. According to some reliable looking experts, my fear that I wouldn’t make enough milk was a cultural one not entirely based in reality. This fear that our bodies won’t rise to the challenge of feeding our babies like millions of bodies have for millions of years might be a primarily North American concern. One not necessarily shared by women globally. That it is actually rare that a women's body won’t do what it was designed to do - sustain life for the first year. I’m not going to point fingers and charge FORMULA CONSPIRACY. I am not doing that. As a new mom I absorbed all of the concern around me (including from the pediatrician) that I wouldn’t/wasn’t making enough milk. I topped off with formula. Then I started with formula and topped off. Then I scaled back, re-doubling my efforts to breastfeed exclusively. Then I went back to topping off when needed. (Usually at least once a day). Now I wonder if I hadn’t, would my body have ‘caught up?’. I think it would have. When I look back, sometimes I would skip nursing sessions entirely and let my husband or my mom feed her formula while I slept. When she went through growth spurts I relied on formula again when she was still hungry after eating, not trusting my own body to adjust to her demands quickly enough. According to the Journal of Perinatal Education (Spring 2009 ) formula-fed infants tend to have higher rates of atrophy (allergies/eczema etc) diabetes and obesity. Why? I don’t think we know that for sure yet. Ellie has some eczema and I wonder if I had breast fed exclusively if she might not have that now? I’m sure I’m not the only mother to worry about these things, especially if she wasn’t able to breastfeed at all. When I was going through the worst of it, in the beginning, I had to go day by day, and feel good about EACH DAY I got through where she got breast milk. I had to let go of the pressure. I had to remind myself (and apparently still do) that any breastfeeding is good, no matter how long. I’m not working, either. 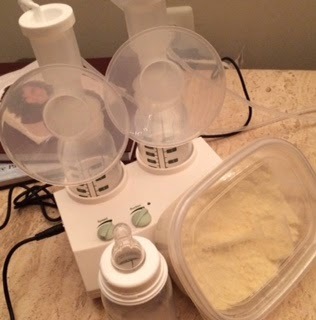 It is so, so much easier to breastfeed when you don’t have to work outside the home every day. Pumping on breaks while working full-time cannot be easy and every mother who does it should have people waiting to shower them in applause every-time they do. EVERY TIME. Anyway. If I had to give advice for new moms out there I would have to say, trust yourself. Trust your body. You’re amazing. Milk isn’t ‘liquid gold’ - it’s abundant and reliable. And if all else fails, lets keep perspective - this ‘nursing’ part of their lives is a tiny, tiny fraction of it so let go of the guilt and worry and leave room for the next twenty years of guilt and worry to come over things we can’t even imagine yet. Huzzah! What fun! You are amazing and I am so proud of you! Sweetie, you are a miracle feeding a miracle.